Malayalam film Ayaal Njanalla has its moments, says Paresh C Palicha. If reimagining or recycling an old theme is considered experimenting then Ayaal Njanalla is easily one of the best experiments in present day Malayalam cinema. 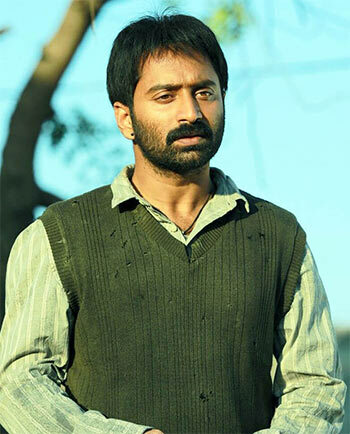 We have seen superstar lookalikes incorporated by filmmakers for spoofs or but in Ayaal Njanalla, Prakashan -- the lead character played by Fahadh Faasil is a simpleton who had migrated to arid Kutchh from Koyilandy. On a short trip to Bengaluru, he realises that he bears uncanny resemblance to an upcoming star Fahadh Faasil. This may be a rare occasion where a star plays himself. To begin with; we see Prakashan as the formulaic hero of Malayalam films, a simple person with a heart of gold, working hard to stay afloat in the face of financial crisis. He is so naive that he is unable to even convey his feelings to his lady love. He works in a tyre repairing shop run by his uncle. He does have big dreams of setting up Dhaba there in the future. The story, by Ranjith, and helmed by actor-turned-director Vineeth Kumar does have the novelty by way of great atmospherics of Gujarat and Prakashan's look. He is vulnerable and does not win the kite flying challenge (his entry point into the story) as a typical hero would. His life goes into further tailspin when his uncle dies in a freak accident and he has to make a short trip to Bengaluru. Prakashan has come here to sell his share of ancestral property in his home town. There is his school friend Arun (Jins Bhaskar) to help him. Apart from using his connections of Malayalis in Bengaluru to help his friend Arun also gives Prakashan a taste of urban life by taking him for an exotic facial and fish pedicure, after that Arun takes him to an upmarket shopping mall to get him a few new outfits. This experience changes his life -- a couple of young girls mistake him for Fahadh Faasil and request him to pose with him for a selfie. Till now we had seen Prakashan in a full grown beard and head full of hair and an angelic smile. Now, to cut the long story short the circumstances make him pose as Fahadh Faasil with a clean shaven face and receding hairline for a public function in a women's college, which drags his life into further complications. There is no denying that there are a few genuinely laughable moments, but in hindsight the situation seems to be far fetched where stars even keep a close watch on the internet for fear of identity theft. Here a fake person attends a public function with hundreds of people there and gets out unscathed. The resolution of all the problems faced by Prakashan is too simple to be believable where the makers have tried to present a layered narrative that goes beyond just being an ordinary comedy. So, we can only suggest that you go and see Ayaal Njanalla without high expectations.